Today is my birthday and it went on like just another day in my boring life. The husband wished me for the heck of it and even bought me something, not because he wanted to but because I'd eat his head about it for the rest of his life, if he didn't show any gesture like that. I blame my parents and friends (and maybe my ex-boyfriends) for this. My mom threw me beautiful birthday parties when I was small and in my teenage years it was treats at restaurants and slumber parties at home. In college it was nights out with the friends and parties at clubs and gifts and flowers. And then, I got married- to someone who thinks all this is overrated- and it abruptly stopped. Forget V day and anniversaries, (its just another damn day to prove you are stuck with the same guy..oh how I envy you single women), but birthdays are very special to me and I somehow expect something from the ONE person who fills my world. And because that one person doesn't care about the day enough, I end up brooding over my life so far and how I miss home and friends so so so much. I have cried on every birthday of mine for the past 6 years and I don't see that changing. So yesterday, I went and watched a romantic drama that made me cry from beginning to end (DON'T watch The Vow, its a waste of money), and today, I watched a horror movie (like being alone in the house wasn't enough) and made through the 95 minutes with my eyes closed, trying hard to not snap at the frikkin giggling girls sitting behind me. I then came back home, curled up on my sofa and did some more brooding (and fantasised about having a whirlwind of an affair with Mc steamy). 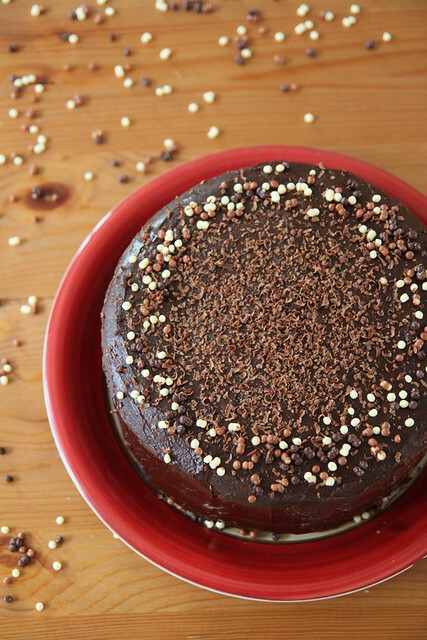 So since I'm not gonna be getting any cake today, I decided to post a chocolate cake recipe here. It's a cake I baked for Ro (yes I still go out of my way to make his birthday fun..call me nuts) a week back , when I'd invited some friends over. As you already know, I hate chocolate and anything to do with it. Chocolate cake tops the list of things I don't like and the fact that I've had a couple of disastrous results doesn't make it any better. Since Ro doesn't care what the end result of anything with chocolate is, I started off making this cake thinking its just going to be average. Boy was I wrong. I must admit that I've never wanted to taste a cake this much in my life. The moment it came out of the oven, I knew I'd like it. Unfortunately, I had to wait for one more day to cut it and taste it which was just too much to handle. But living with a husband who spends an hour (minimum) in the bathroom kinda takes your patience level a notch higher, so pat on the back for me. Whisk together the first 6 ingredients in a large mixing bowl. You can either do this using your wire whisk or if you have a free standing mixer, use the paddle attachment and on low speed combine all the dry ingredients together. In another bowl mix together the buttermilk, oil, eggs and vanilla extract till they all come together. Add this to the dry ingredients and beat on low till well incorporated. Butter and line 2 9" pans and pour the batter into each. The best way to get more or less even size cakes are to weigh the batter in each tin. I usually do this, but this time I measured approx. 3 cups of batter for each tin and got cakes of the same size. Place the tins in the centre rack of an oven preheated at 176C and bake for 35 minutes or till a skewer comes out clean. Take them out of the oven and leave aside to cool for about 15-20 minutes, after which you can turn it onto a wire rack and wait for it to cool completely. While that's taken care of, make the ganache. Chop the chocolate as finely as possible and place in a heat proof bowl. Bring the double cream to a boil in a sauce pan, over medium heat. Take it off the flame and immediately pour over the chocolate. Let it stand for a couple of minutes after which you can gently start stirring using a whisk or wooden spoon (without incorporating any air into the ganache) till you get a smooth glossy chocolate mix. Add the caster sugar and gently stir until melted. Keep aside for 15 to 20 minutes for it to slightly harden. Not too much though. OK so you can basically use the ganache in three different ways- Fill the cake with whichever icing you prefer, put on the other layer, place the cake on a cooling rack and just pour the ganache on top, enabling it to drop off the sides as evenly as possible. Messy, but good shiny, glazed topping would be the end result. Second would be to whip it up like how you do a normal whipped cream frosting. Bring the ganache to room temperature and whip on high for 2 minutes or so. This could work for cupcakes. Third, would be to let the ganache harden a wee bit and then use it like how you would do for a butter cream icing, for more thicker frosting and piping designs...which is what I did. Place the cake on a stand/plate in which you are going to serve. Generously douse a layer of ganache on top, evening it out with a palette knife, as much as possible. 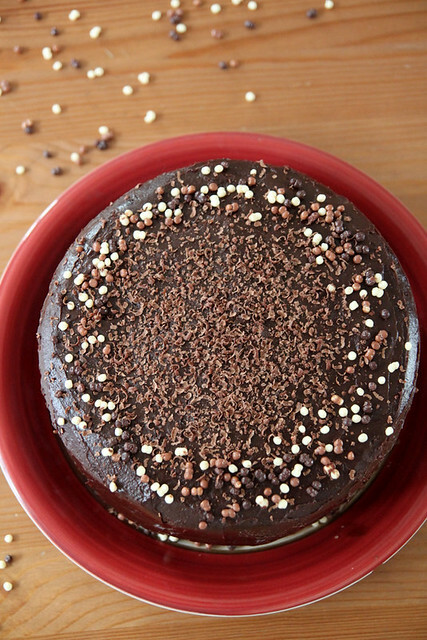 Place the second cake on top and do a crumb coating by doing up the entire cake in a thin layer of ganache. Try and smooth it out as much as possible. If you ask me, this is the hardest part of frosting a cake. Keep aside to set for a while and then do the final coating...go ballistic with the remaining ganache and coat the entire cake..again, try and smoothen it out as much as possible. Decorate with chocolate balls, wafers, chocolate shavings or just grate some chocolate on top and place it in the fridge. Two hours before serving, bring it back to room temperature and slice using a knife dipped in hot water so you get a neat slice. Enjoy with some vanilla ice cream or on its own. Notes: Please use the best possible cocoa available. Dutch processed would be ideal. One cake had a dome, so I had to slice a bit of the top using a serrated knife. As I mentioned before, I'd baked the cakes the previous night and once they had cooled down completely, I wrapped them in cling film and stored in the oven at room temperature. They didn't dry out and was as moist as it should be. Plain chocolate is different from dark chocolate and milk chocolate. Dark choc. would make this more bitter, but if you prefer that, go ahead with the option. The espresso coffee can be replaced with instant fresh coffee. I put 2 tbsp of instant espresso powder into a cup of boiling water and used that. I didn't bake both the cakes together because I only have one pan. I also have ready made cake liners (like massive cupcake liners) which I use religiously. So once cake 1 was done, I waited for 5 minutes, and moved it on to a cooling rack (with the cake liner). Placed cake liner 2 into the same cake pan, filled with batter and baked for the exact same time. Took it out and cooled as usual. This is probably not the best way to go about baking 2 cakes, but they both turned out gorgeous. OMG! Nisha, we both baked the same cake today! :) The cake looks beautiful! 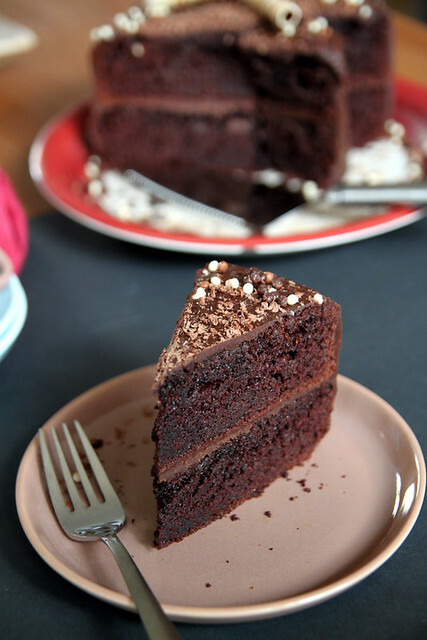 Chocooooooooooooolatey...looks awesome perfect slice... Hope u guys had wonderful party. Happy birthday! Hope you have a super day ahead. What a beautiful cake btw. My husband's family is the super traditional kinds that don't believe in celebrating birthdays & anniversaries too, whereas my family always threw get-together & rejoice with family friends ... so I totally understand. Happy birthday gal :-) Lovely chocolate cake! Awwww. Sweetie, here's a huge hug from me. Hope you had a happy birthday after all. 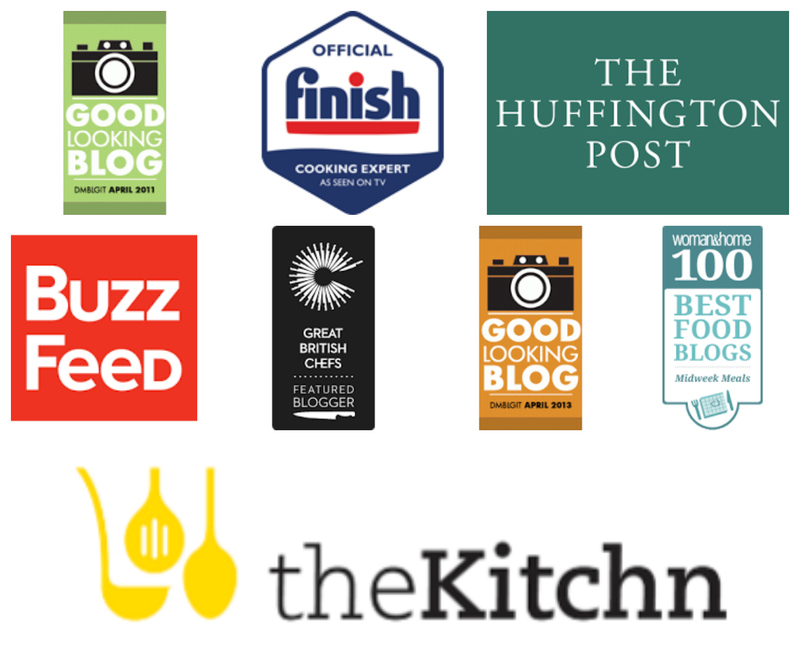 PS: Does Ro read your blog? If not, I would suggest you put him on the mailing list. Sometimes the dopes (oops, sorry, dears) don't know the turmoil they cause with their I'm-the-big-guy attitude. Heh heh.. sounds exactly like our household! I was into celebrations; my husband is totally not.. sole consolation? i get to decide which gift i want and buy it to myself whenever i want :) cake is rockingly delicious; happy birthday! Cake looks awesome. I wish I was there to get a taste of it. mindblowing! !beautiful and delicious cake!perfectly done! WOW, this cake looks so moist and delicious! Happy birthday! Belated birthday wishes Nisha! If its any consolation, the cake looks fab! and you are not alone when u fantasize abt McSteamy! :P so there! but jokes aside, i hope you have a great year ahead! and trying very hard to be the devils' advocate here, what's a great year compared to one lousy day? :) Keep the faith! and i hope i made you smile. Cheers! Happy Birthday, cake looks awesome. Hope you had a nice time. Story of my life too :-) I used make a big fuss about not celebrating my b'day in a proper way since my hubby is exactly like yours in these matters :D Now after almost 12 years I'm getting used to a card or some flowers he gets for me, that too not every year ,but no chance for Valentine's day..lol We celebrate V day just for kids,they celebrate it in school and I make something for their friends. Many many happy returns of the day !! I really hope u never have to cry on your bday ever again !! love the cake and the not so sweet really got my attention !! Have to try this. Love the pixs as usual awesome !! OMG!! That cake looks absolutely gorgeous! 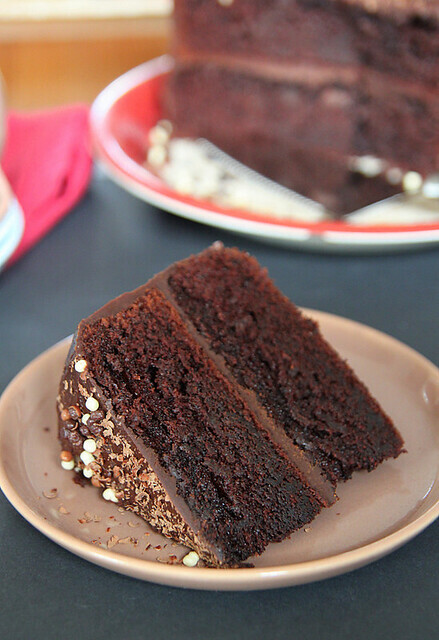 So moist and dark and rich!! Love it! Wishing u a very happy birthday :) Cake looks awesome, excellent job n clicks !! 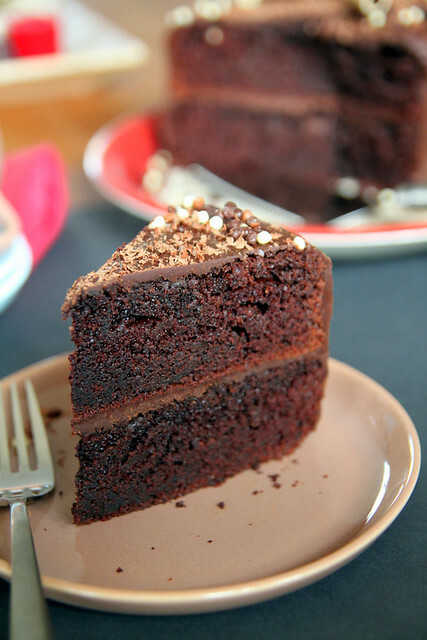 Love the chocolate cake and chocolate ganache combo. Have a similar one I made for my Ammama's bday sitting in my drafts :)Yours looks spectacular though! Love those cute chocolate balls. Oh and what is it with men and birthdays! I get all excited anyhow and use it as an excuse to bake to my heart's content :) Happy birthday hugs Nisha. Have a fabulous year ahead. happy bday dear...i also baked a similar cake...:)...and i wish that u don't ever cry again..specially on ur bday....!! !god bless u ! Gorgeous cake for a gorgeous girl, happy birthday sweets! Like yours, my hubby's does not care about b'day, whereas I'm a total b'day girl. So you can imagine... & the disappointments continue, sigh. I think it's awesome that Ro remembers the little stuff :o) Mwaah! Tempting cake,chocolaty and yummy..Great Job! A decadent piece of cake you have got there! Looks so moist and lovely. such a beautiful cake! your pictures are gorgeous, the texture is so vivid i feel like the cake is right in front of me... but i cannot get to it aahh. Awww dear... happy birthday! You post made me very sad too, even I like to be pampered and being single and away from home I end up crying too. Hope you never have to cry again on any birthday or any day :-/. 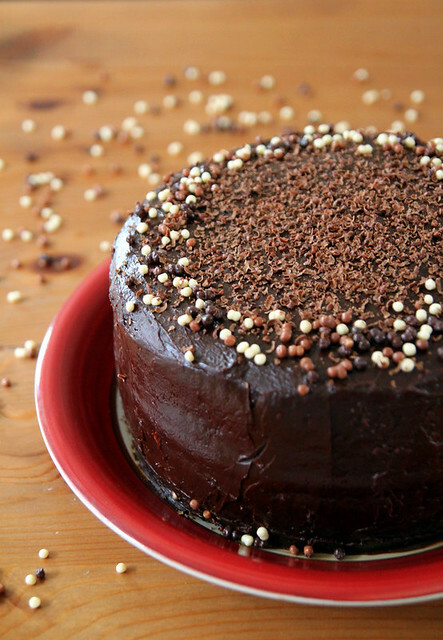 The chocolate cake look yummy...so soft and moist, very tempting. belated birthday wishes!and to Roshan too...birthdays and special days...yes yes big deal! the cake looks divine. Expect the least from men and you will feel better..That's what I do, so when they come up with something it will make you happy, especially when it is least expected....Hugs to you sweetie. I sure can understand your feelings, but you will get over it..
BTW, does Ro, his family and all read ur bloggie? I am not sure how they would take it! That cake looks gorgeous!Is it intensly chocolatey?? The same story here too. I guess I am starting to accept that a whole crowd of mallu men are like that. I would love to believe that but then I see so many of them around me celebrating bdays. My husband's family celebrates anniversaries, and I dont understand the big deal about it. But bdays, none remembers. Until a few years ago, when the new calendar for the next year is in .. the first thing I do is to check the day of my bday. Now I am teaching myself not to bother. But when the day passes unnoticed its not easy ..
Hi Nisha, I am glad to pass on The Versatile Blog Award to your lovely blog. Lovely cake. Absolutely stunning. bookmarking it. That is such a gorgeous cake! Being a chocolate fanatic, i would have eaten up the whole thing myself! I wish i could hate chocolate like you, that would be at least one less thing that i have to worry about finding its way onto my hips! And u know what, my husband is exactly like urs. no bday celebrations, v-day etc.. and now ive given up on celebrating his and we dont even get gifts for each other now... i dont like it this way... but then i tend to complain more and get into a even worse mood if ive gifted him and he doesnt gift me... the fact that our bdays are just a day apart adds to the frustration :) but yeah.. we learn to survive.. i hope ..